Laboratory/Department of Energy artist's conception, public domain. In the 1950s and early 1960s, the development of controlled release of nuclear energy (as opposed to runaway reactions in nuclear weapons) seemed to make previously impossible things straightforward matters of engineering. On occasion, it made the unthinkable all too thinkable. Project Pluto, also known as the Supersonic Low Altitude Missile (SLAM), is one of the most extreme exemplars of this epoch. Unlike Project Orion, which envisioned a four thousand ton interplanetary spaceship powered by nuclear bombs, and Project Plowshare, which proposed using nuclear explosions for large civil engineering projects such as digging a new sea-level Panama canal, Pluto/SLAM (which I'll henceforth refer to as Pluto) was developed and tested to the point where the technology had been proved. Pluto could have been deployed in the 1960s had the project not been cancelled due to financial reasons, competition from rival technologies, and people coming to their senses. 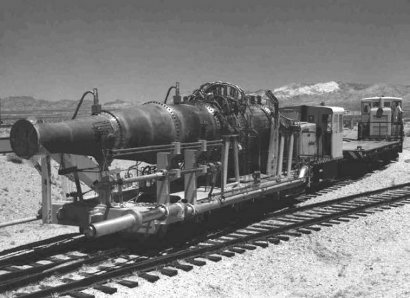 Pluto was a nuclear powered ramjet cruise missile, as large and heavy as a steam locomotive, which could fly between three and four times the speed of sound either at high altitudes or skimming the earth, with global range and the ability to stay airborne for months, and then to rain nuclear destruction upon multiple targets with high accuracy. Let's unpack this description to understand just was was being developed. The key distinction between nuclear and chemical energy (whether in explosives, propulsion, or generation of heat) is that while a typical chemical reaction (for example, combustion of hydrogen and oxygen to yield water) releases energy on the order of a few electron volts per molecule, a nuclear reaction, such as the fission of uranium, releases a few million electron volts per atom. Thus, a given mass of nuclear fuel yields around a million times as much energy as the most energetic chemical reactions. All of the capabilities of nuclear energy, for good or ill, derive from this. In the 1950s, the United States developed three principal means of delivering strategic nuclear weapons: the so-called strategic triad which remains in place today. First to enter service was the manned bomber. Bombers offered precision strike capability and could be recalled at any time, but they took a long time to reach targets on other continents and were vulnerable to air defenses, both manned interceptors and missiles. Keeping a bomber force on alert was expensive, as multiple crews had to be trained and kept proficient, and the bomber hardware required regular maintenance. Guided missiles, the second leg of the triad, provided an alternative to the bomber force. First to be developed were cruise missiles, pilotless aircraft equipped with a guidance system to direct them to their targets where a warhead will be detonated. Much smaller than manned bombers, cruise missiles are less expensive, and can be kept in a state of readiness without training flights. Early cruise missiles were no faster than manned bombers, but as the fifties progressed, supersonic cruise missiles were developed. Ballistic missiles are rockets which lob a warhead directly to the target. An intercontinental ballistic missile can hit targets on other continents within thirty minutes of launch, and be based in hardened shelters which make them hard to destroy in an enemy first strike. The third leg involved missiles launched from submarines rather than bases on land. Since it is very difficult to detect and track a submerged submarine, these missiles are essentially invulnerable to a first strike, and provide an assured ability to retaliate. 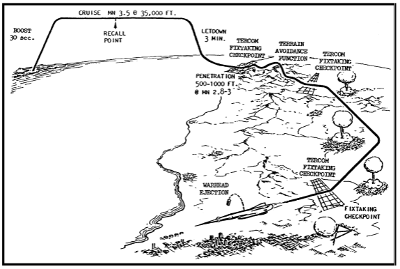 However, at the time, submarine-launched missiles had neither the long range nor the accuracy of those based on land. With any strategic weapon, one worries about a technological leap by the adversary which will render one's own weapons obsolete. For those whose job was to worry about such things, there were numerous causes for concern. It takes many years to develop and field a new manned bomber, and there's always the risk that progress in air defenses will make it impossible for the bombers to reach their targets. Research into anti-ballistic missile defenses was an active topic in the 1950s and '60s, and there were several promising approaches which might blunt the effectiveness of both land- and sea-based missiles. Finally, detection of submarines was a cat-and-mouse game where both sides were investing in technologies to counter the threat. Success would negate the invulnerability of the submarine-launched deterrent force. A major justification for the strategic triad was that should an adversary field a defense which countered the effectiveness of one leg of the triad, the remaining legs would continue to provide deterrence until a response was fielded. Maintaining a diverse portfolio of weapon delivery systems avoided betting everything on the effectiveness of one technology. It isn't cheap, the argument went, but it's a lot cheaper than the aftermath of an enemy first strike invited by a perceived vulnerability. It was into this environment that Project Pluto was proposed. Its unique capabilities made it almost qualify as an additional leg of deterrence, and one which would be extraordinarily difficult to counter. Central to this was its power plant: a nuclear ramjet. 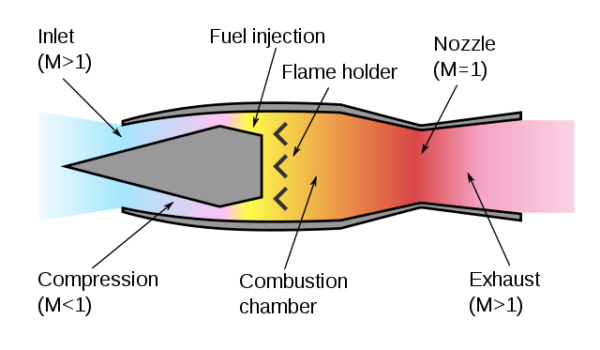 A conventional turbojet engine is shown below. Air enters the engine at the left, and is compressed by a series of spinning compressor discs. The air then enters combustion chambers where it and fuel are burned, producing hot gases under pressure. These gases pass through a number of turbine discs, which extract sufficient energy to spin the compressor. The hot gases are then expelled through the exhaust nozzle, producing thrust according to Newton's third law of motion. The compressor is required to achieve the high energy combustion necessary to produce thrust. But if the engine is moving rapidly enough through the air, its own motion can compress the air entering it sufficiently, eliminating the need for a compressor and the turbine that powers it. This is called a ramjet, as it is the force of air being rammed into the engine which produces the required compression. As is evident, this is a dramatic simplification over the turbojet. The only tricky part is designing the engine inlet to obtain the required compression of the incoming air. There is, however, a catch. A ramjet can only achieve the compression it needs to operate when moving at supersonic speeds: ideally around three times the speed of sound (Mach 3). Consequently, a ramjet requires a booster (usually a rocket) to accelerate it to operating speed, after which it can operate in a steady state. Once the air has been compressed by the inlet, fuel is injected and burned, which produces the hot gases expelled by the nozzle. Once a ramjet begins to operate, it will continue to produce thrust as long as fuel is supplied to burn with the incoming air. Ramjets are much more fuel efficient than rockets, since they do not need to carry their own oxidiser, but instead use oxygen from the air. Still, they tend to be “thirsty”, and the amount of fuel which can be carried limits their range. But the only function of burning the fuel in a ramjet is to generate hot gas under high pressure to expel from the nozzle, yielding thrust. Suppose we replaced the combustors in the engine with a nuclear reactor. Air, passing through the reactor, would be heated to its operating temperature and expelled through the nozzle as before. No combustion takes place; it's cold air in and hot air out. The only limit to endurance is the lifetime of the nuclear fuel (measured in years) and the ability of the airframe and other components to withstand the stresses of flight. While combustion is sensitive to air pressure and temperature, with no combustion in the engine, the nuclear ramjet could operate equally well at low altitude and high, and provide performance “on the deck” unmatched by any other kind of engine. National Laboratory photo, public domain. The potential of the nuclear ramjet was such that studies of both engines and missiles began in the mid-1950s. In 1957, the Lawrence Radiation Laboratory (later Lawrence Livermore National Laboratory) began detailed design studies of ramjet propulsion reactors. The flight reactor was intended to have thermal power in excess of 500 megawatts, but to prove the concept a sub-scale reactor was built first. This reactor, designated Tory II-A, had a design power of 155 megawatts. It heated incoming air to a temperature of 1080 °C, and had a flow rate of 320 kg/sec. As a non-flying test bed, no effort was made to reduce the weight of this reactor. Recall that a ramjet only works when the air entering it is moving faster than sound. Further, compression of the air by the engine's inlet would heat it to around 540 °C. To test the engine under realistic conditions, an enormous tank farm was built at the test site at Jackass Flats, Nevada, using oil well casing pipe to store 54,000 kg of air compressed to 245 atmospheres. Before air entered the engine, it was heated by passing it through a vessel containing 544,000 kg of ball bearings heated by a gas furnace. This allowed running the engine at full power for up to one minute. Several tests were run in 1961, and other than some minor cracking in the fuel elements, the reactor performed to specifications. Once the reactor had gone critical for the first time, it was extremely radioactive and, having no shielding, would have been lethal to anybody who approached it, even when it was not running. 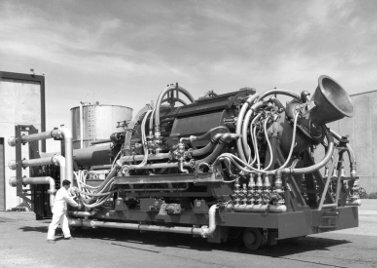 The reactor was installed on a railroad car, which an automated locomotive could transfer between the test stand and the assembly/disassembly building, where heavily shielded test cells allowed it to be manipulated by remote control. With these procedures in place, there seemed no obstacle to developing the full scale engine. With the success of Tory II-A, work began on Tory II-C, a full-scale, flight-weight reactor capable of sustained low altitude flight in excess of Mach 3. With design power of 500 megawatts and much greater airflow, the tank farm had to be expanded by a factor of ten, employing 40 km (25 miles) of oil well casing pipe, which took five days to fill with air. This sufficed for a five minute test run of Tory II-C, which was sufficient to demonstrate steady-state operation and measure the thermal and radiation environment around the operating reactor. While further improvements to the design were on the drawing board, in two test runs in 1964 Tory II-C demonstrated that it would get the job done. With the engine development proceeding toward flight hardware, in 1963 Ling-Temco-Vought was awarded the contract to develop the airframe, with Marquardt chosen as contractor for propulsion hardware other than the reactor. Intended to fly near Mach 3 in the thick lower atmosphere, the missile would undergo aerodynamic and thermal stresses never before encountered. With the nuclear powerplant, however, there was no need to trade off weight and strength as in conventional aircraft. Most of the structure was made of stainless steel, with high temperature sections near the reactor using the René 41 alloy earlier used in the Mercury spacecraft. So robust was the structure that project director Ted Merkle nicknamed it “the flying crowbar”. With no need to carry fuel on board, the design was simple: nuclear engine, guidance system, and warhead(s), with small control surfaces to steer. There were no wings; at supersonic speeds, the shape of the missile body provided sufficient lift. Solid rocket boosters would lift Pluto from its launcher (both fixed and mobile launchers were envisioned) and accelerate it to the speed where the ramjet could operate. The reactor would not go critical until the moment of launch, rendering it safe for ground personnel in pre-launch operations. Pluto/SLAM mission profile. Ling-Temco-Vought illustration. Armament is variously described in contemporary documents, and one draws the conclusion that a firm decision was never made as to the weapons load operational missiles would carry. Most sources envision an option of a single very high yield bomb or multiple (anywhere from 8 to more than 20) smaller bombs. In the multiple bomb configuration, the bombs would be delivered to separate targets as the missile followed its programmed flight path. With unlimited range and endurance, there were no limits on the attack profile. The guidance system would have been extremely accurate. After using inertial navigation to fly at high altitude to the border of enemy territory, Pluto would dive to treetop level and begin its dash to the target(s), guided by a radar system which compared terrain passing under the missile with a stored terrain model. This was expected to deliver weapons on target with an error on the order of tens of metres. Modern cruise missiles use a system called TERCOM, which is a direct derivative of this design. Unlike naval propulsion or civil nuclear power reactors, Pluto's reactor had no radiation shielding whatsoever. Avionics would be placed as far from the reactor as possible and in a shielded vault to protect it from the intense neutron flux. The radiation emitted from the operating reactor would be lethal to anybody in the vicinity, including people beneath its flight path when operating at low altitude. In addition, the shock wave from low level supersonic flight would destroy unreinforced structures and severely injure people who weren't already killed by the radiation. A Strangelovian suggestion was that the missile, after releasing its last bomb, could simply fly around enemy territory, destroying structures and killing people with its radiation. Even when in high altitude flight en route to the target country, the engine would spew fission fragments in its exhaust, leaving a trail of fallout behind it. Critics said the acronym SLAM should really stand for “Slow, Low, and Messy”. Nobody ever came up with a satisfactory way to flight test the missile. It was suggested that test flights might be conducted over the Pacific, with the missile ditched into the deep ocean at the end of the flight, but even in the 1960s, this was likely to face public opposition. Finally, strategists feared that deploying a new weapon against which there was no existing defense would destabilise the strategic balance and provoke the Soviets into developing their own version. Adding a Soviet Плутоский to the existing nuclear threat wasn't a prospect anybody welcomed. Through 1963, total funding for Project Pluto, including its test facilities, was US$ 260 million in then dollars, or 2 billion today. Estimated unit cost for a purchase of fifty operational missiles (less warheads) was around US$ 50 million (400 million today). With the McNamara whiz kids in the Pentagon on the warpath to cut budgets, and with Pluto not estimated to be operational before 1969, it was an irresistible target, and in July 1964 the project was cancelled. By then, ballistic missiles were operational, and the solid fuel Minuteman missile, which was flight-proven and cost a fraction of Pluto's price, was entering mass production. Pluto was the solution to a problem which no longer existed, at a price which wasn't affordable. Project Pluto was the last episode in the grand romantic era of nuclear power in the postwar period. In the 1950s, nuclear generated electric power “too cheap to meter”, nuclear automobiles, and nuclear airplanes seemed right around the corner. In the New York Times of June 10, 1955, Alex Lewyt, president of the Lewyt Vacuum Cleaner Company, was quoted predicting “Nuclear powered vacuum cleaners will probably be a reality within 10 years”. In fact, it was nuclear reality that had set in, and the pendulum would soon swing to an irrational fear of a technology which, intelligently applied where appropriate, still retains its million-to-one advantage over chemical energy that inspired the optimism of the early atomic age. Project Pluto is a documentary about the project, including contemporary film of the development and test phases. The film is presented in five parts in a play list, which you can view below. 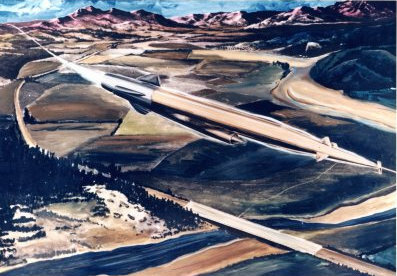 Big Stick was a competitive design for a nuclear ramjet missile proposed by the Convair division of General Dynamics. Here is a 1959 film describing the concept.